The ever so slightly pervy-looking guy on the cover of this CD promises to take his listeners on "a journey of hits from 'Sunoh' to 'Kaho Naa Pyaar Hai'", and if I knew what that meant I could probably tell you whether it does or not. As it is the fact that I can't understand a word of what he's singing about kind of puts me off buying his back catalogue. Opening his hits collection with the highly evocative windswept soundscape of 'Sunoh', he proceeds to warble his way through eleven tracks, seemingly concentrating mostly on soup and that often misunderstand grass product, hay - though I probably am losing a bit on the translation. The funky sound of 'Ek Pal Ka Jeena', from the "mega hit" Bollywood movie "Kaho Na Pyar Hai", effortlessly mixes in good old eighties synthesisers with the often underestimated rock instrument, the pan pipes, while 'Teri Yaadein Aati Hai' concentrates more on his country rock guitar playing and, fittingly enough, on making hay. The highlight of the album has to be that classic pub sing-a-long favourite 'Nahi Rata Dil Mein Kuch', come on everybody, I know you know the words "I can't be tired at the womb pour on driver, oh cheesy Wooh Woah, better late for the sucky tv, jesse iglesias"! All in all, this album sounds like what it is, an Indian guy singing the hits of Bollywood in Indian. 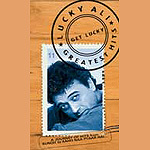 There is no denying that our friend Lucky is a big star, his very presence on stage at shows such as the All-Star Peace Concert in Mumbai in August 1998 and the Channel V Awards was apparently enough to send Indian audiences "into a screaming frenzy", before he even started his seductive singing. However if you don't speak Indian, have never seen a Bollywood movie, and don't intend to, this is probably not the album for you, or me. If you do find yourself listening to it in the future though I highly recommend track number ten, 'Kitni Haseen Zindagi Hai', simply for the amusing boing-boing-boing-click-click-boing backing track, highly reminiscent of a certain Rolf Harris: "Can ya tell what it is yet?" sorry Lucky, but I have no idea.